When people always asked me, what did I like about Bing Maps, it was always the Bird’s Eye View. It was something that Google didn’t have in their map API and it really was useful since a top down view doesn’t always tell the full story. Well today Google announced that they too are going to have what they call Aerial Imagery in their API. Yep, that is the same perspective view that Bing Maps has with their Bird’s Eye View. Now of course how could one really get that excited about Google adding oblique imagery. 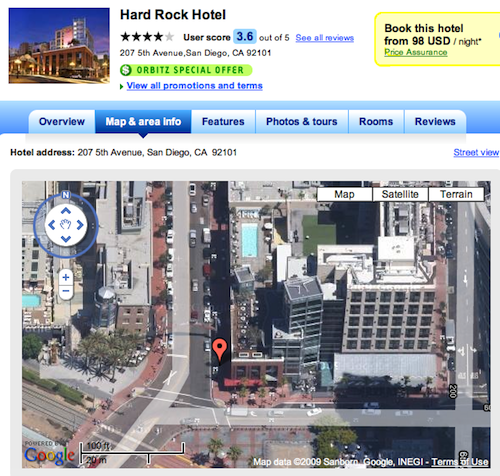 Well unlike Pictometry, you can zoom out much further on the data so you can see how one might get from the Hard Rock Hotel to the San Diego Convention Center (Bing Maps is of course out of date). Isn’t that so much more valuable than the top down version I just can’t see how any current Bird’s Eye View user can continue to use Bing Maps over this (Shall we count the days until Zillow changes?). What I’m interested in seeing which company can build out their “new service” first. 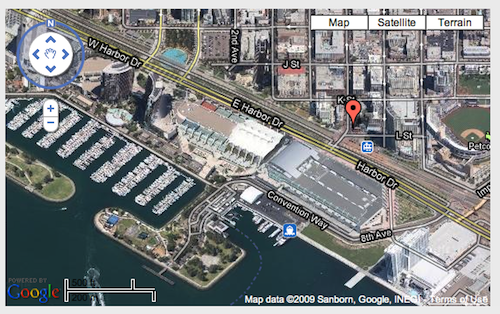 Google with their oblique aerial view, or Microsoft with their street level view. I think we all know who will be throwing more resources at getting this done, don’t we? The one weird part is this appears to be in the v2 API only. I suppose this is because launch customers Orbitz, Redfin and Trulia are all using that version of the API on their websites. v3 can’t be far along.